No matter the level, professional baseball is definitely a man’s game. Depending on the level, there is the five or six month grind in the regular season – not counting spring training, and if lucky a post-season. Then, there are the off-season workouts, or for some, fall and winter leagues. It’s an arduous marathon of double-digit hour days that strains the body and taxes the mind. Yet, all who play the game professionally got into the game as Little Leaguers because the game was fun. Along the way, amidst the monotony of ground balls and batting practice and bullpens and flips and shagging flies and meetings and interviews, etc, etc, etc. some forget that the game was once fun. 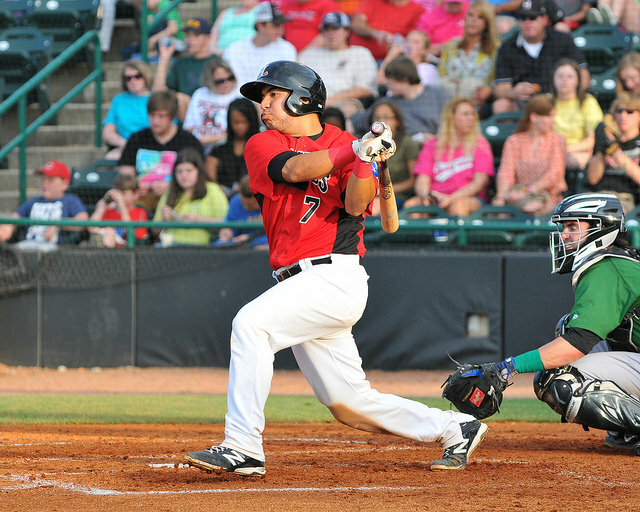 Campanella never met Hickory Crawdads catcher Jose Trevino, but it’s players like Trevino of which Campanella spoke. You cannot imagine Trevino not having fun in baseball. Stay around the Corpus Christi, Tex. native for very long and you get the feeling that he loves the game. Talk with him for a 12-minute interview, and you’ll be ready to don the uniform yourself, grab a bat and glove and hit the field. But his exuberance about the game is not strictly between the lines. 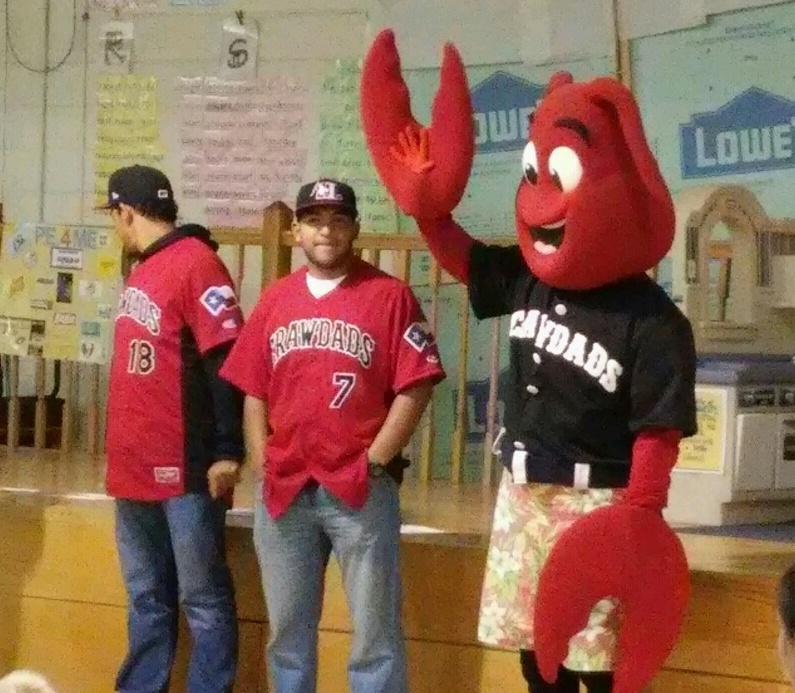 You can see it in a player appearance, such as one he did at Southwest Elementary school as a part of their summer reading program. You can see it at a table on Saturday night, or along the left-field fence, as he interacts with those seeking post-game autographs. You can see it, as he chats with preteens from the on-deck circle during a game at Kannapolis. I spoke with Trevino Friday about his season and how the team is faring as they push for a playoff spot with 13 games to play. He also spoke about his infectious personality and the joy he had in a former college teammate – Chi Chi Gonzalez – getting to the majors. First of all, I want to ask as a totality, how do you feel your season going? Trevino: I’m feeling good and I think our team’s playing good. We’re not as hot as we were in the first month, but that’s baseball. You’re going to have streaks, but you just keep grinding it out and just keep having fun. Keep playing for the guys around you and do whatever the team needs you to do. We just try our best every day and trying to win a ballgame every day. What’s been the highlight for your season so far? Trevino: Just being a part of this team. It’s a good group of guys. I’ve never seen so many guys work so hard for something that they want. I mean, it’s everybody. It goes on down the line from me to the pitchers. Everybody knows what they want. Obviously, the ultimate goal is to get to the big leagues, but everybody is so focused on the now. Everybody wants to do good now for their teammates, for Rags (manager Corey Ragsdale). We’re always trying to play hard for each other. I like being a part of this group. These guys are really good guys. As you guys are in the midst of the playoff chase, what’s been the mood of the club overall? Trevino: Just keep playing. Nothing has changed from the beginning. Baseball is far from being easy. If it were easy, everybody would be playing. We’ve just got to keep grinding it out and keep having fun every day. Go out there and do your best and the end of the day we’ll see where we are. That’s usually the way we go about it. Just give everything you have, and if we win, we win. If we lose, we tried our best. There’s really nothing else to it. You’ve got West Virginia starting to creep up a bit. Are you guys feeling any pressure from that, or do you guys feel like we’re going to take care of thing on our end and not worry about it? Trevino: We’re not really worried about them, that much; we’re just worried about ourselves. We’re just trying to keep positive attitudes in the clubhouse. We’re not really worried about them. We can’t control what they’re doing; we can only control what we’re doing. As long as you’ve got a good attitude and a good effort every day, we should be alright. You got off to a hot start in April; May’s been a little bit of a different story. What are the adjustments that you’re been working on to get back to where you were earlier in the season? Trevino: Nothing really. It’s baseball, you know, and it’s going to happen. People are going to find holes and people are going to expose them until can hit them. That’s pretty much what’s been going on. I feel like we’ve all ran into some bad luck as a team. We’re all hitting the ball, but it’s just getting caught. Last night’s game (Thursday’s win at Lakewood), finally, we got one of those hits where it’s, alright, we’ve got one. Here comes another one and here comes another one until finally you saw the team that we had in the first month. I think at any moment – this team is that good for where we can be like – okay, we can score eight runs right here and we can put this together. We’ve just got to keep being positive and keep grinding it out. Our team’s a really good team. What has been the biggest adjustment for you from this time last year when you were coming out of Oral Roberts and just getting started in pro ball? Trevino: I can’t think of anything. Pro ball is pro ball and you’ve got to play every day. It’s a good thing because it’s like in school, you have recess every day and this is fun. Playing every day, I’d love to play every single game, every single inning. Sometime people say, you need to get your rest. But, it’s fun and I have no problem with it. I feel like, if you’re doing something you love, there’s no way you can really get tired of it. Your pitching coach (Sean Snedeker) at Oral Roberts spent some time at Hickory. Have you had a chance to talk with him about your pro career any? It’s just a thing that I’ve always had. I’ve always loved to play the game. I feel like everybody on this team loves to play the game, too. That’s why we’re good. That’s why we have fun doing what we do. Coach Snedeker, he’s a great guy – our pitching coach. For the two years I spent with him, he was great and I love the dude. Good guy. You seem to have an infectious personality. You’ve talked several times about the love of the game. 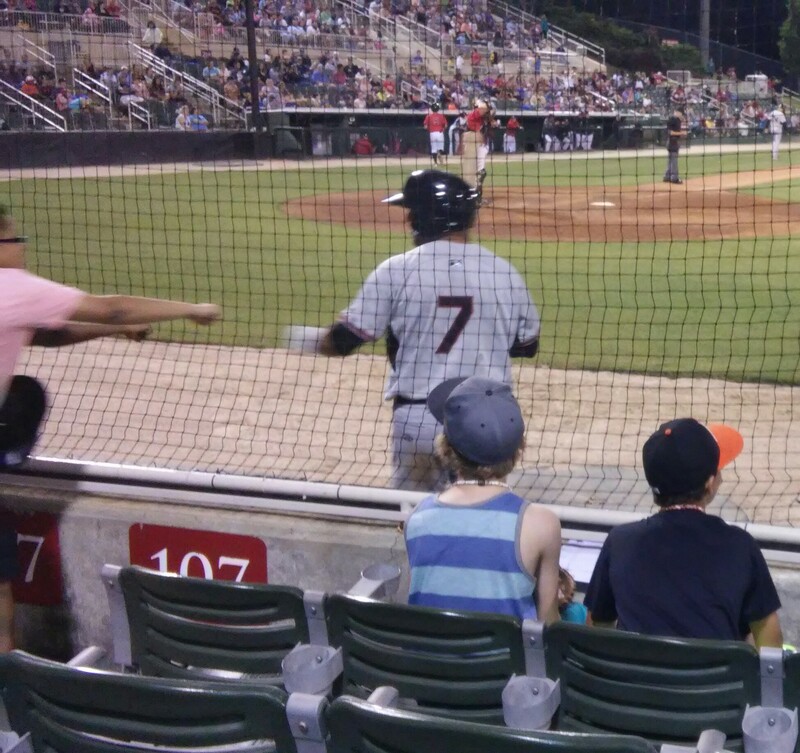 I see you at Kannapolis when you are fist bumping kids from the on-deck circle. Where does that come from? Where did that develop for you? Trevino: I don’t know. I guess I just get it from my family. My family, we just like people. We like meeting people. We’re really open to people. I just feel like it comes from my family and from my roots. My whole family is like that. We love to meet new people to welcome to new things. This game, you can’t take this game too seriously. I found that out right from the beginning in college ball and in high school ball. You can’t take this game too seriously, or it’ll come back and bite you. As much as it is a job, it’s a more of thing you love to do… For me, being out in the field, having a say-so in the young kids coming up, I feel like you can have a positive way in their life. Whether it’s a fist bump, or like, “hey, man, what’s going on,” or giving a baseball to a kid, or something like that, I just keep having fun. A big part of the story of this team has been the pitching staff, which night in and night out will give you guys five, six, seven strong innings and then turn it over to a bullpen that’s been really good. What have you seen from behind the plate from this group? Trevino: Ah, the pitching staff, they’re unbelievable. It’s a really good group of guys and everybody cares for each other, like I said in the beginning. If our starter has a runner on second base, that reliever’s coming in is saying, “I’m not giving up that run.” They don’t say it to each other, but you know already that’s the mind set, “I’m not giving up this run.” It just goes to show that they don’t want to give up his run, and they don’t want to give up a run for the team. It all comes back and they’re all giving it back to us. It’s a great pitching staff. They know what they’re doing and they’re unbelievable. They’re really good guys. What’s a successful season look like for you? Trevino: Getting a ring would be awesome. I haven’t had a ring in a couple of years, since college. I would love a ring and would love to bring a ring to Hickory to Rags and for Guzie (Ronald Guzman) and all the guys that got moved up and stuff, and also for all the guys that are on the team now. We all worked so hard in the off-season and in spring training and in spring training and this is fun for us. Just to get a ring and to be able to celebrate with these guys would be the best thing – no individual things or anything, just for these guys. To who will it mean the most when you get a call up to the big leagues? Trevino: I’d have to go on a speakerphone to all my family. It’d be awesome. I just really want to see my family in the stands, when I’m in the big leagues. If I’m fortunate to get the call, I just want to see my family the way that Alex “Chi Chi’s” (Gonzalez) was. That was awesome. I felt like I was a part of that. Me and Chi Chi go a long way back, so it was awesome to see him there. I want to see my family just like that. Have you talked with Chi Chi since he got up? Trevino: Yeah, I talked to him. We’ve talked a little bit. We had a little conversation. He was pretty excited and it was fun. I sent him a text and he was real excited about it. It was awesome. The year he got picked in the first round by the Rangers, our whole college felt like we were picked first. We were like, “Yeah, Chi Chi!” It was awesome to see him up there. It was good.